My edits begin with a notepad and numerous sharp pencils – all within arms reach of a range of dictionaries, grammar books, style guides and a sturdy thesaurus. Yes, I have these resources online too, but find a hard copy easier and more intuitive to use when I’m immersed in text. I don’t rely on spell checks and certainly not an online thesaurus, which is always too limited. I can always tell if someone has changed a word and used the Microsoft Word thesaurus because the available options are so limited. 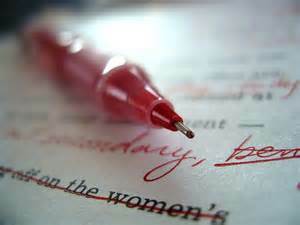 All writing should be clear and unambiguous, period. Every sentence you write should count and add value and texture to what has gone before. Don’t overuse metaphors and similes, and avoid clichés and jargon. Avoid those qualifiers which add nothing to the to the meaning of the text – for example: that, even, simply, actually, despite the fact that, although, just, then. If the text reads well without them, and the meaning remains the same, you don’t need them. And exclamation points/marks should only ever be used in dialogue. Don’t write over long paragraphs – visualize how the text will look on the printed page of a book. White space around your words can have as much impact as the words themselves – think how effective a single line paragraph can be in the right place.